The late December snow was a blessing for Vermont’s ski towns — and, in Stowe, it was probably a boon for a new bistro. Mark Fucile and Linda Hunter bought the brick-red Ten Acres Lodge in November. 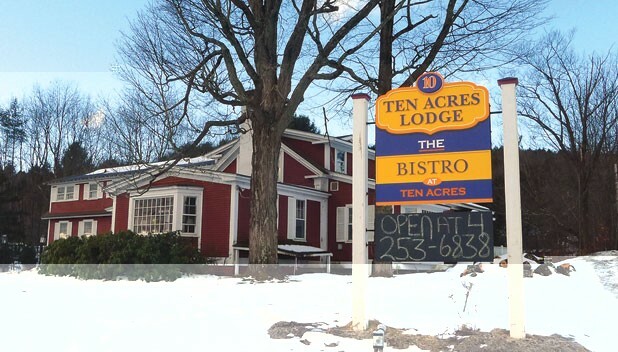 After a quick renovation, they reopened its bistro (14 Barrows Road, Stowe, 253-6838, tenacreslodge.com) just before Christmas; Fucile says “it’s been very busy” ever since with a mix of locals and tourists. With paint, pillows and paintings, the couple spruced up the former Lagniappe — the Cajun-Creole restaurant that operated at the Lodge until early last fall — with warm colors and patterns, and built a curved bar atop old Jim Beam barrels. Behind that bar is a rotating tap list of local brews such as Shed Mountain Ale, Fiddlehead IPA and Northshire Brewery Chocolate Stout, as well as spirits and 12 wines by the glass. Lagniappe chef Gary Jacobson stayed on and designed a menu of upscale comfort food. Starters include pineapple salad with jicama, grape tomatoes and a sesame vinaigrette; oysters on the half shell; moules marinière with house-baked bread; pork rillettes; and a truffled mushroom risotto topped with a poached quail egg. Roast duck with braised red cabbage and apples makes an appearance as a dinner entrée, as do braised pork shank, a daily fish special dubbed Seafood Epiphany and steak frites. Jacobson has kept a few popular holdovers from Lagniappe, including barbecue shrimp and pan-seared lobster with a bourbon-tarragon sauce served over polenta. The bistro is open Wednesday through Sunday for dinner, and the bar opens at 4 p.m.